Is Port Isaac the New Padstow? With the two-starred Restaurant Nathan Outlaw just crowned the UK’s best restaurant by the Good Food Guide 2017 and Port Gaverne Hotel voted Cornwall’s top Gastropub, Port Isaac is Cornwall’s new foodie heaven. Since 2007 Restaurant Nathan Outlaw has been building its reputation under the patient guidance of its titular owner. Unpretentious, confident food focusing on the ultra fresh fish and seafood coming in every morning from Port Isaac’s day boats. His unassuming and determined approach to let the quality of beautiful local produce shine while food fads come and go has been rewarded this summer with the ultimate accolade from The Good Food Guide – The UK’s Best Restaurant. It’s a significant milestone for the north Cornwall fishing village, but it’s also a reflection of the big changes that have been happening there over the past few years. The Fishermen’s Friends and Doc Martin helped put Port Isaac on the map as a tourist hotspot, but there’s recently been a food renaissance in the town which has attracted huge influxes of people from all over the UK marking the tiny port out as a must-visit stop on their tour of Cornwall’s top gastro-destinations. Word is getting out. A quarter of a mile round the headland from Restaurant Nathan Outlaw is The Port Gaverne Hotel. A quirky 17th-century inn nestled in a sun-catching cove, it was taken over by husband and wife team David & Jackie Barnard in 2014. Their whole career has been dedicated to unearthing hidden hospitality gems and making them shine. In only three years the hotel has been transformed from a nice pub with rooms into a multi-award winning destination restaurant and place to stay. Head Chef James Lean, who learned his trade under Nathan Outlaw and Angela Hartnett, has built a dedicated kitchen team who use the best of the bounty on their doorstep. The menu is generous, seasonal and coastal. Lobsters from their own pots in the bay, superb aged steak from local butchers, the freshest fish from Port Isaac all feature prominently on the menu. You know things are happening when the money starts to pour in. Backed by St Austell Brewery, the Barnards have overseen huge investment in the hotel which has resulted in a tripling of turnover and allowed them to reinvest the profits in what they see as their most exciting project yet – Pilchards Beach Cafe. 30 seconds from the hotel and almost touching the sea, Pilchards is the result of two years planning and a cash injection from the brewery of something north of £500,000. 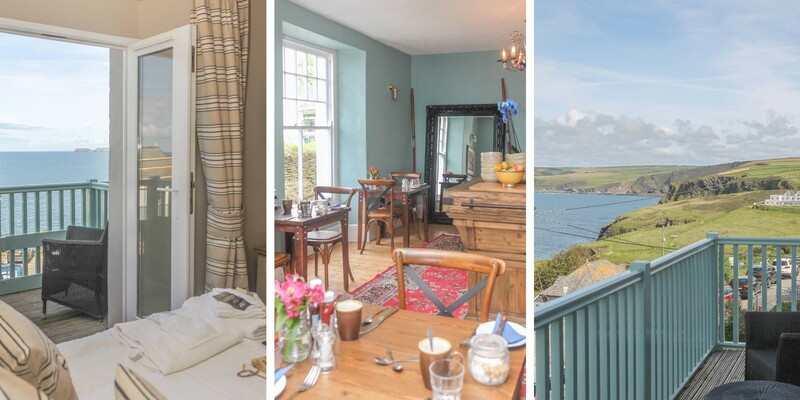 Back in Port Isaac, directly opposite Restaurant Nathan Outlaw, you’ll find Stargazy Inn. It’s just been taken over by the Barnards who have rapidly and lovingly restored it to its former Victorian glory. The views from the rooms are breathtaking and the breakfast of all local farm eggs, bacon and jams is exquisite. Residents seem reluctant to move from the dining and drawing rooms, more content to just gaze out over the Cornish coastline, which remains stubbornly beautiful whatever the weather. Padstow, a few miles down the coast, is looking nervously over its shoulder.